The big cottage Punda Milia was completed in 2014 after about a year of designing and constructing. 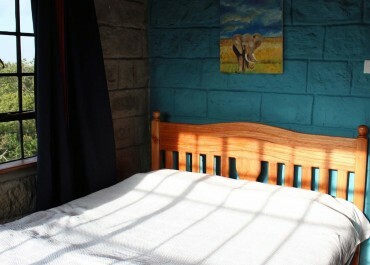 The cosy and inviting self-catering cottage is situated on the Sandai Farm next to the Aderdares. 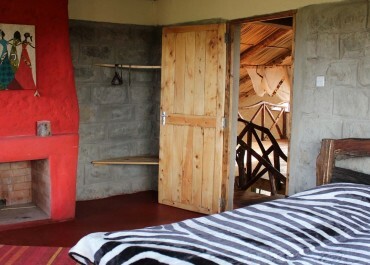 The cottage can sleep up to 8 and is fully equipped with everything you need for a stay in the Kenyan Highlands. 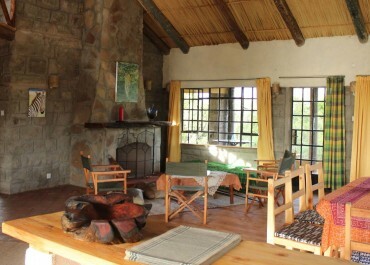 The cottage has a large open living room which consits of a cosy seating area with an open fireplace, a large dining table and a large open kitchen. 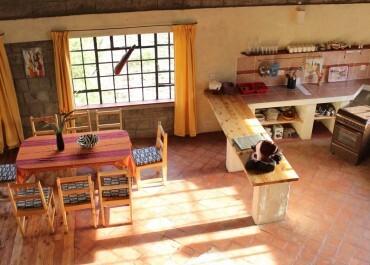 The kitchen is fully equipped with a gas cooker, sink, fridge, cooking utensils and dishes. The inviting verandah with a magnificent view is a perfect place to have meals, sundowners or to simpy just relax. 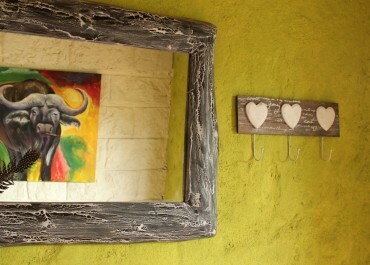 The big Cottage Punda Milia has four fully furnished bedrooms and three bathrooms. Three of the rooms have double beds and one room has a bunk-bed. The master-bedroom has its own ensuite bathroom equipped with a shower and bath-tub. The other room on the second floor has its own fireplace and spacious balcony. The open-gallery offers enough space to place an extra mattress. The cottage is completely self sufficient. The water is provided by a well and the rain water that is collected. Hot water is heated by solar panels. Electicity is also provided by the solar panels. Kitchen fully equipped with dishes, sink, electric cooker, etc. The big cottage Punda Milia consists of the four bedrooms and three bathrooms. A large and open living, dining room and kitchen that is fully equipped. Three bedrooms have double beds and one had a bunk bed. Bathrooms are equipped with bathtub/shower, WC and wash basins. The cottage had a large verandah and balcony with a beautiful view of Mt. Kenya. Rate Big Cottage Punda Milia !